Alhamdulillah, SCIL A Level Programme has been successfully running since September 2014 in the Girls Branch and A Level classes for Boys have also been initiated this year. SCIL A Level Programme is in direct response to the apprehensions of those factions of society who consider it both morally and physically unsafe to send their children into an environment devoid of Islamic values and traditions. 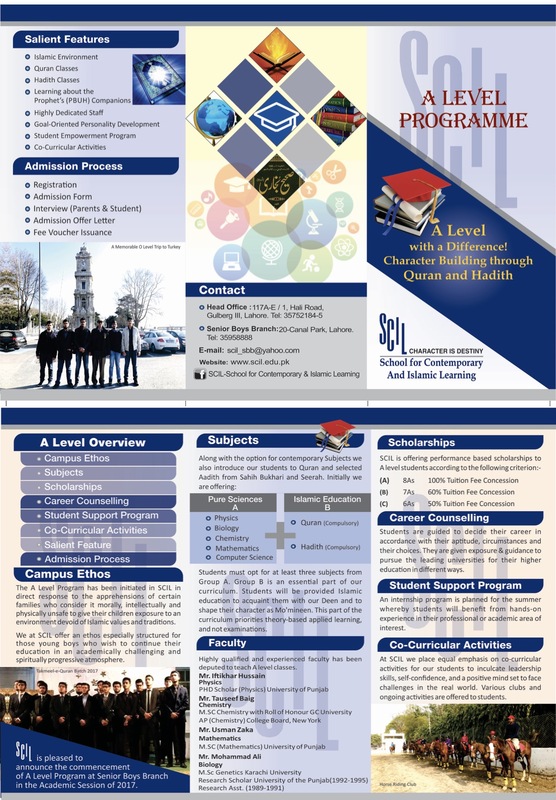 We at SCIL offer an ethos especially structured for those young students who wish to continue their education in an academically challenging and spiritually progressive atmosphere .Along with the options for contemporary subjects we also introduce our students to selected courses in the Quran, Ahadith and Seerah. Opportunities for community service are offered to nurture public spiritedness and empathy for the less privileged segment of the community. All this is carried out in a friendly and open environment which encourages debate, discussion and tolerance for diversity. Quran Classes: In addition to the ‘A’ Level subjects selected by the students, Quran classes will be compulsory for all ‘A’ Level students for equipping them with the Islamic knowledge for assuming the role of “Mominaat” as desired by the Quran and Sunnah. *The students must take at least three subjects from either Group A. Group B is an essential part of our curriculum. Highly experienced teacher working in renowned institutions of Lahore, including LGS JT Boys & Girls, since 2005. Highly experienced A Level teacher teaching at renowned institutions of Lahore including Aitchison College. M.Phil (Political Science) Kinnaird College for Women, Lahore. MA (Economics) University of the Punjab. Senior Lecturer at Kinnaird College for Women since 2005. Teaching Computer Science and AICT to O & A Level students for the last 21 years and has 7 distinctions to his credit. a) (a) Grades of only nine subjects of ‘O’ Level will be considered namely English, Mathematics, Urdu, Physics, Chemistry, Biology, Additional Mathematics, Pakistan Studies and Islamiat. There is an equal emphasis on academics and co-curricular activities that helps to instill the qualities of self-motivation and leadership in our young Muslim men and women. 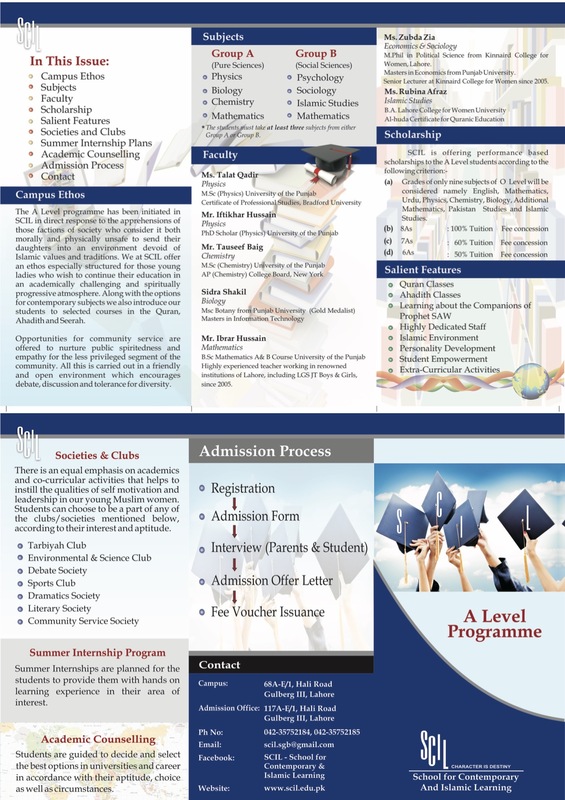 Students can choose to be a part of any of the clubs/societies mentioned below, according to their interest and aptitude. Summer Internships are planned for the students to provide them with hands on learning experience in their area of interest. Students are guided to decide and select the best options in universities and career in accordance with her aptitude, choice as well as circumstances.